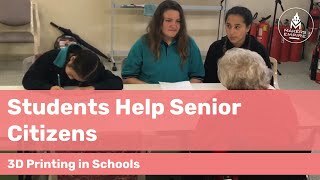 This information has been created for Western Australia public primary schools that are successful recipients of the Western Australian Curriculum Support funds. Each selected school will have a permanent classroom converted into a science laboratory and has been allocated $25,000 to purchase equipment and resources to support their whole-school science programs. This can include 3D printers and related resources. 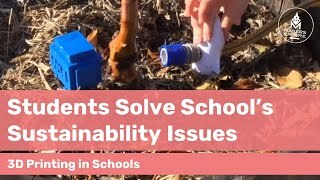 Interested in integrating 3D printing into your school as an authentic learning tool? Follow the following guide for best results. 1. What are 3D printing equipment and resources? Equipment – 3D printer(s). 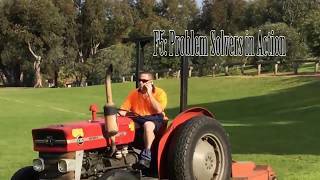 Budget $500 – $2000 per 3D printer. There are many 3D printers on the market but not all are suitable for use in a primary school. Primary schools have different learning environment, younger students and dedicated primary school teachers. Easy to use 3D design software that K-8 students can design on. Makers Empire understands what 3D printers and resources are needed to for schools to successfully integrate 3D printing into the curriculum. Backed by our learning team, we’ll strive to ensure your implementation is a success. 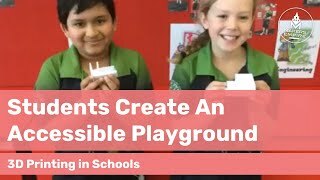 We delivered large scale implementation 3D printing school projects like our 50 school implementation with DECD in SA so you can be sure we have the learning expertise to help your school. Makers Empire provides 3D printer and resources packages include hardware training and support via video call so no matter where your school is, help is on hand. 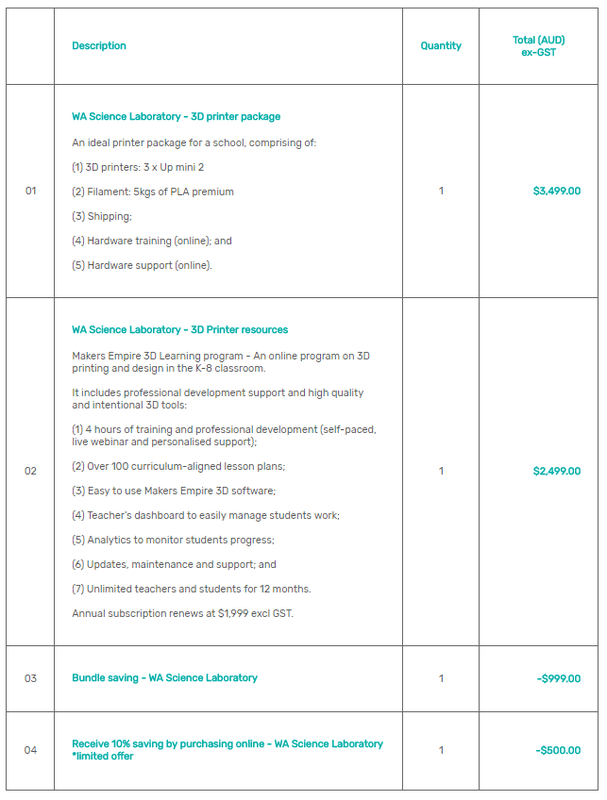 Purchase the specifically packaged ‘Makers Empire WA Science Laboratory 3D printer and resource package’ here now for only $4,948.90 inc-GST (receive $999 bundle savings + $500 when purchased online). 3D Printers – 3 x Up Mini 2 – 3D printers with air filtration and filament will be shipped to your school. Training and support via video call and support. 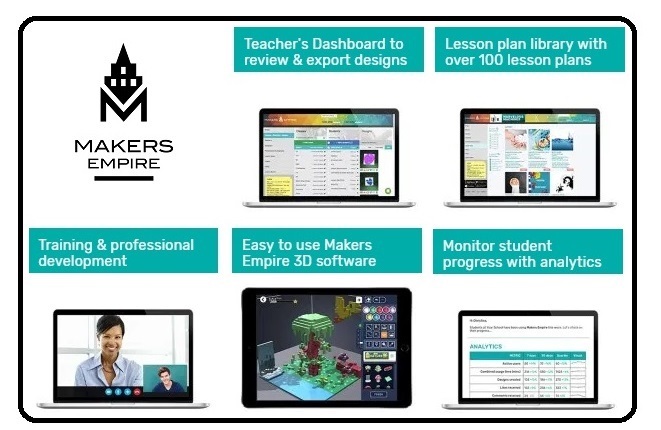 Resources – Makers Empire’s award winning 3D printing resources includes, lesson plans, teachers dashboard, 3D design software, teacher learning support and more. This is an annual subscription and schools are billed annually. 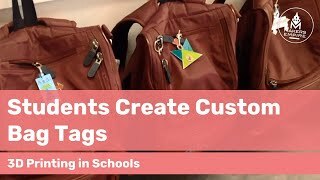 After you have made your purchase, your order will be placed and delivered to your school. Our team will contact you to organise a time to complete training via video call and also connect you with our learning team to support your school’s implementation. If you have any questions you can start an online chat with us at the bottom chat circle or email us at info@makersempire.com, subject: “WA Science Laboratory – your school name”.